Description: Although not the course the C.H. Alison originally designed, the struggling complex was bought by Suffolk County in the 1970s, and was altered so that another nine holes (the White) could be built. 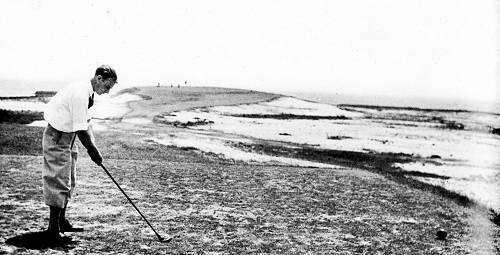 The now 27-hole facility that sits along the Great South Bay still has some of the original Alison holes (mostly on the Blue nine) yet was lost in the shuffle of great L.I. golf courses for a long time because of its sub-par conditioning. That is now a thing of a the past. With the conditions pretty good and still getting better, the terrific holes that exists on these two nines - along with the wonderful scenery - are being recognized as just about the best bang-for-your-buck on L.I. The Red nine starts you off in the middle of serene parkland golf, but by the last three holes you are playing holes that are carved out of marshland. The Blue nine is just about as good as it gets, as fairways and greens are bordered by the lightly crashing waves of the Bay. There is no let up anywhere on this picturesque and wind-swept track. Reader Comments: One of the best kept secrets on L.I. ... The Blue nine is comparable to any nine holes in the area ... Beautiful and challenging; a pleasure. One of the most picturesque courses in the NY anea with many holes playing along the Great South Bay and others with stunning views of the bay. From the tips, this can be a real challenge for the finest players, and if the wind is up it becomes a real bear. Not overly penal and quite fair, it makes for a wonderful round of golf, can play it every day. Description: This scenic course overlooking the Hudson River was built on the former site of Letchworth Village, an early insane asylum opened in 1911 and slowly phased out in the mid 1990’s. The course plays along some of the old buildings, which are boarded up but give a old-course feel to this new and very enjoyable layout. With an immense amount of land (195 acres of total property), the course is spread out and holes are divided by large swaths of dense trees, giving a feeling of serene quiet. There are also some beautiful elevation changes that make for great views of the river. Most holes are pretty open and the greens are somewhat large, but well-placed bunkering makes it an enjoyable experience for every level of golfer. Reader Comments: A relaxing and enjoyable golfing experience on a beautiful piece of real estate ... If you know where to miss, it’s not too tough, but miss in the wrong place and you’re dead ... A real pleasure.